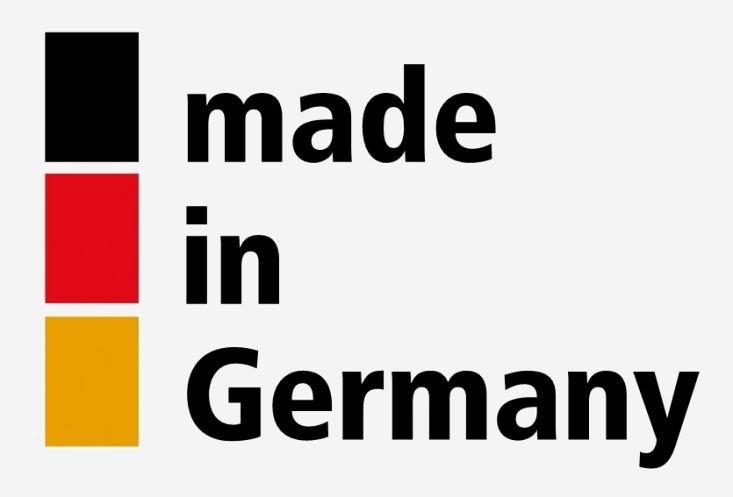 on stock, but requires programming of country grid-code (2-5 days). Made in Germany by AEconversion micro-inverter INV350-90EU are designed for residential and commercial grid-tied solar applications. Each micro-inverter, connected to an single PV panel performs DC to AC power (230V/50Hz). Through the individual conversion at each PV panel, the sun energy can ideally be used. Brings high efficiency and flexibility in system design. The INV-350-90EU micro-inverter allows to connect up to 350Wp PV solar panels with max 80Voc. Do not exceed the allowed connectable voltage (appears as Voc) under any circumstances, applies to all inverters and PV charge controller. In systems with central or string inverters, the series connection of PV panels often causes energy losses. If the performance from a single PV panel drops, for example through shading or mismatching, it reduces the performance of the whole string. This problem is solved by micro inverters, because every PV panel work independently, for highest possible energy yield. Disconnects automatically when missing the local grid. According to the VDE-AR-N 4105 in all AEconversion micro-inverters the monitoring switching device (MSD) is already integrated. This ensures that each inverter separates itself (switch off) from the power source during a power outage or network disconnection (when missing local grid). MSD also prevents island formation and feeding back the PV electricity into the local grid, which could possibly lead to dangerous consequences. Besides a performance and system protection, the AEconversion Micro-Inverter does not need further monitoring or shut down devices. This simplifies every installation and reduces installation time and costs. Please see above in the price section availability of country grid-codes (configurations). Other countries also available, please check (ask us) before ordering. Before delivery, each micro-inverter need to be programmed for the national grid-code. Programming by the manufacturer take around 1 week time. The NOCOM version is not available for models: INV-350-90 and INV-500-90. Summary: communication over existing AC-lines via 230V power plugs at home/office/factory, within the same network and before energy meter (inverter<>PLC-gateway<>datalogger<>PC). Advantage of this type of communication is that the communication is implemented by using the existing AC lines and thus makes additional connectors or cabling for the inverter unnecessary. Each micro inverter is connected via DC wiring (blue line) to an PV module. The DC current is then converted to grid compatible AC power, without affecting the performance of other PV modules. Through the AC lines (green line) the micro inverter can be connected to an AC circuit of about ten inverters. All created AC circuits (strings) are connected to the Powerline Gateway. The Power Gateway provides an connection for grid compatible AC power with the network at home/office/factory, and communicate performance data to the data logger. In this way each inverter is connected with datalogger (black line). The collected data are stored in the data logger, and forwarded to the monitoring station, typically an PC and can be visualized using any internet browser. 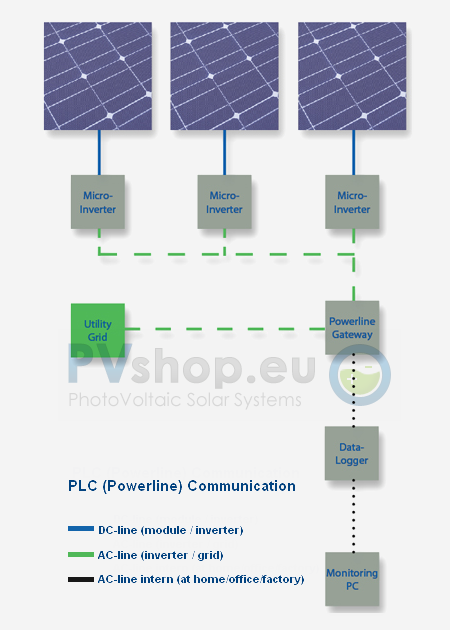 Why PV solar micro inverters? See our short guide about micro inverters advantages.